Into a large bowl, pour ½ cup of warm water and stir in the yeast to dissolve. Add the sugar. When the mixture begins to froth (proving that the yeast is still lively) stir in the remaining 2 cups of water. Gradually add 3 cups of flour, 1 cup at a time, stirring vigorously. (You may either do this by hand, or with a stand-mixer.) You’ve now made a “sponge”. Allow it to rest for 10 minutes, or until it too froths. Stir in the salt and 2 Tablespoons of the oil and mix together well. Gradually add the remaining flour – you may need less than the total amount specified – once you have a dough that holds together into a ball and isn’t sticking wetly to your hands, you’ve added enough flour. Knead well by hand in the bowl, or on a floured board, ten minutes or so; or in a stand mixer using the dough hook for maybe 7 minutes. You’re looking for a smooth, shiny and elastic dough that no longer sticks to your fingers when held for several seconds. Dust with a bit more flour occasionally if it proves too sticky. Form it into a ball. Put the remaining tablespoon of oil into the bowl and roll the ball of dough around so as to grease it all over. (This prevents a crust from forming on it.) Cover the bowl with plastic wrap and leave in a comfy warm place free of drafts for about 2 hours, until doubled in bulk. Preheat the oven to 500°F (260°C), placing a large baking sheet in the hottest part. (Generally about ¼ of the way up from the bottom.) Allow it to preheat for 20 minutes. 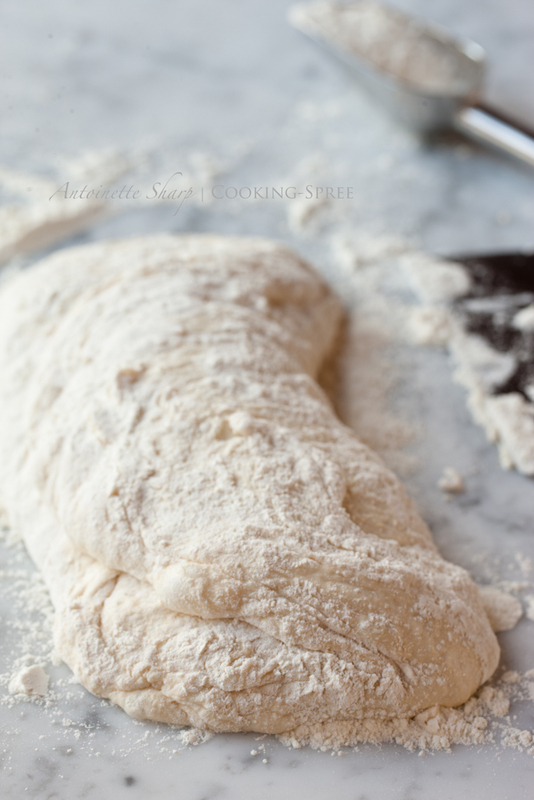 Punch the dough down and then knead again for several minutes. Divide the dough in half. Divide the first half into 8 “equal” lumps and roll these into balls. It’s time I told you of some plans. On Wednesday April 4th I’ll be heading out of town, gone for 9 days. Gone to meet, to hold and to fall in love with our family’s newest and littlest little. Besides nuzzling of soft powdery neck and losing my heart again, I’ll be preparing some meals, hiding-and-seeking, story-telling and tending to Ali, the littles’ mama. In anticipation, yesterday was largely spent in the kitchen, making muffins (and more & more muffins) and two batches of granola. We’ll all be pretty busy at breakfast time, so a bowl of yogurt topped with fruit and crunchy granola, or nutritious muffins in one hand and baby in the other will put us one leg up on the day. GratefulGuineaPig is out of town and comes home in the afternoon of the same morning I leave. Our ships will pass in the night, so I’ve left him some muffins for breakfast too. In the basket, Morning Glorious Muffins. 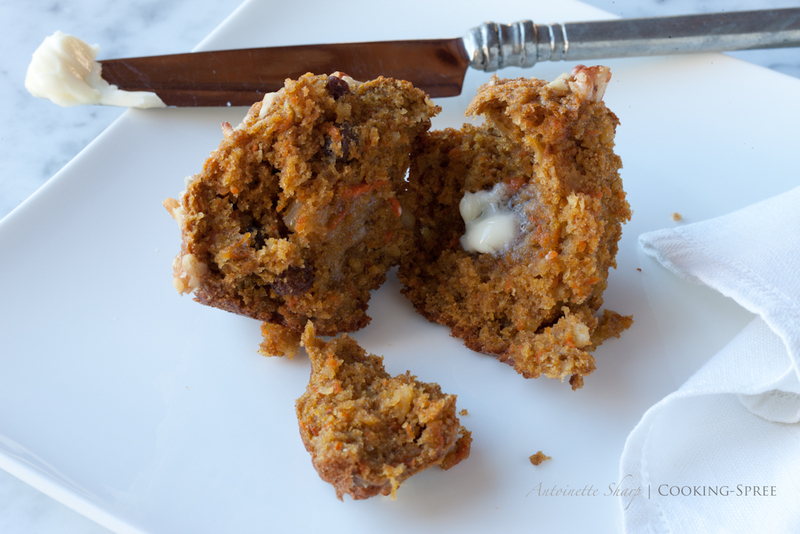 Earlier I posted a recipe for the above muffins. You can find them here. 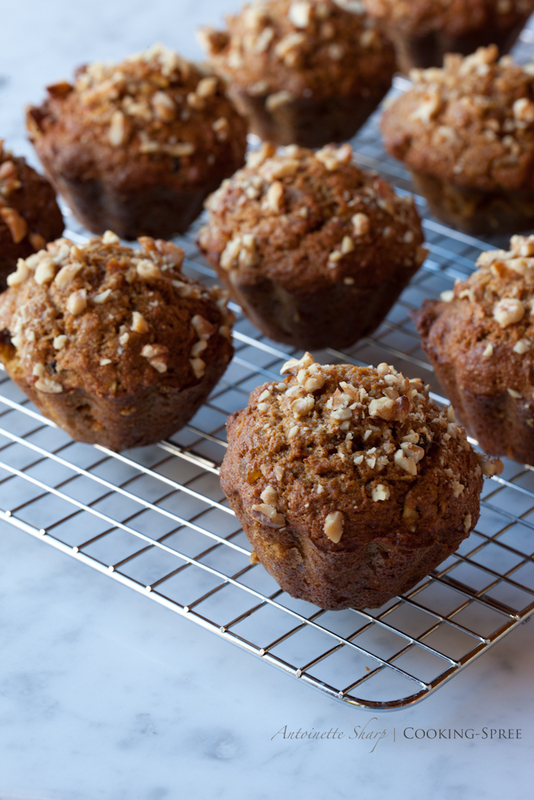 But the muffin I’m about to share with you is ta-da G l u t e n F r e e. That matters to an increasing number of eaters out there. And what I’m discovering in sampling some of these g-f recipes is that the baked goods that result are extremely Tender & surprisingly Delicious! A number of them win the taste test over traditional flour recipes, with hands tied behind their backs. (I’d have lost good money if I’d bet on that one.) Here’s one plucked from the pages of La Tartine Gourmande that I thought you’d like! Quinoa flour – wheat-free, gluten-free, an ancient grain that adds a richness of flavor as well as a complete protein. 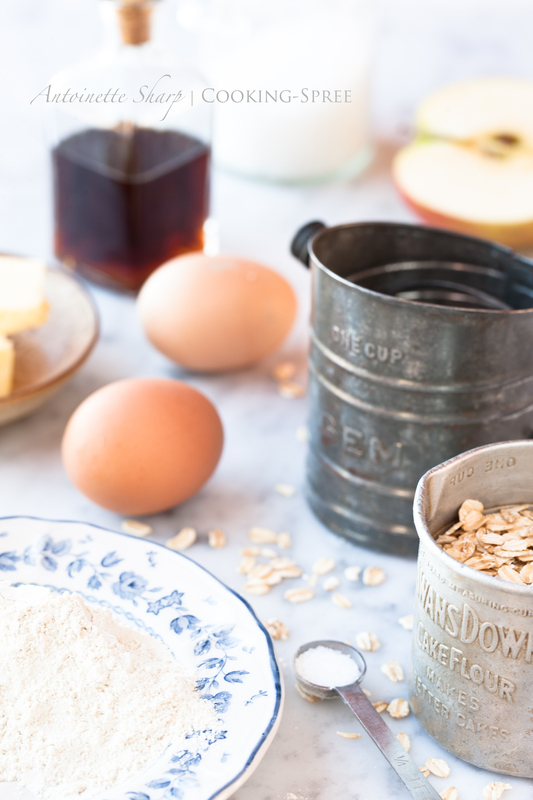 Millet Flour – one of the earliest cultivated grains (5,000 years ago in China!) it has a sweet flavor, high in amino acids and fiber and contributes a delicate, cake-like crumb to the baked goods it’s in. Again, easily digested and gluten-free. 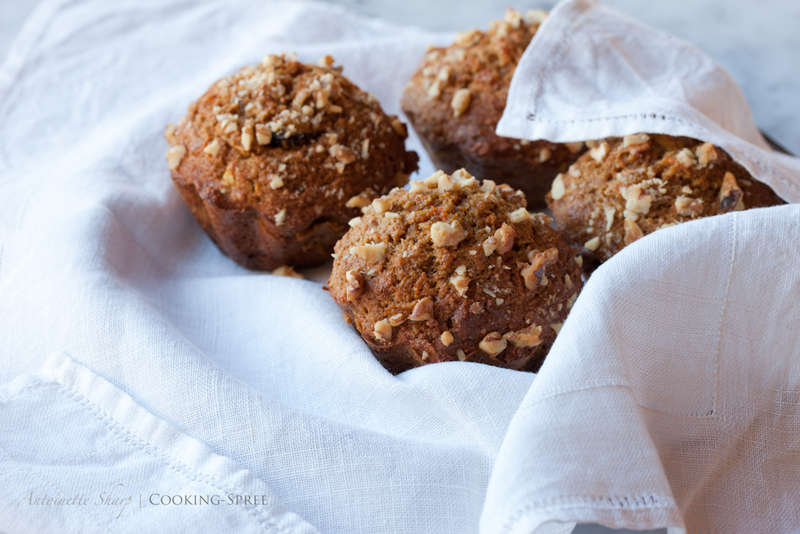 Add in Gluten-Free Rolled Oats, tahini, grated apple, and this muffin packs a nutritional wallop and starts the day off right. Preheat oven to 350°F (180°C). 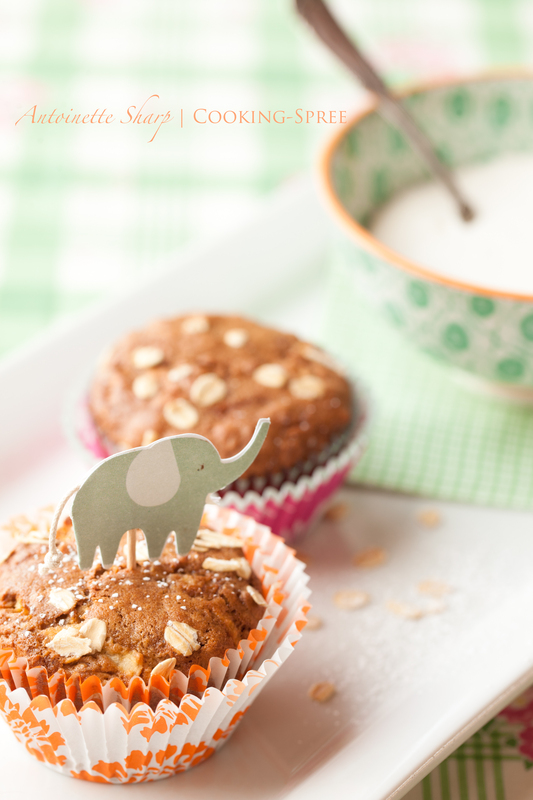 Line a muffin tin with 10 paper muffin cups, or use silicone muffin molds. This bread has been a favorite around our house for years. There’s hardly ANY time at all in the actual preparation. No muscles required, no sporty (red or otherwise) stand mixer to pull out of its cupboard. Just a food processor and a couple simple ingredients and you’re in the bakin’ business. Of course, like all yeasted breads, there’s time spent loitering around. You design what form your loitering will take, but here’s how to make the bread – so easy, you might confuse it with play. 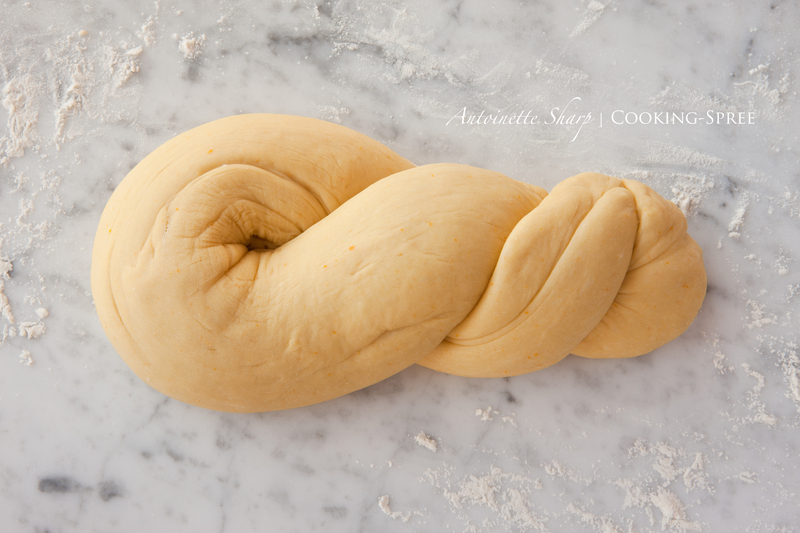 First, I’ll give of all the instructions for the basic braided loaf (in the style of Challah, a Jewish egg bread.) 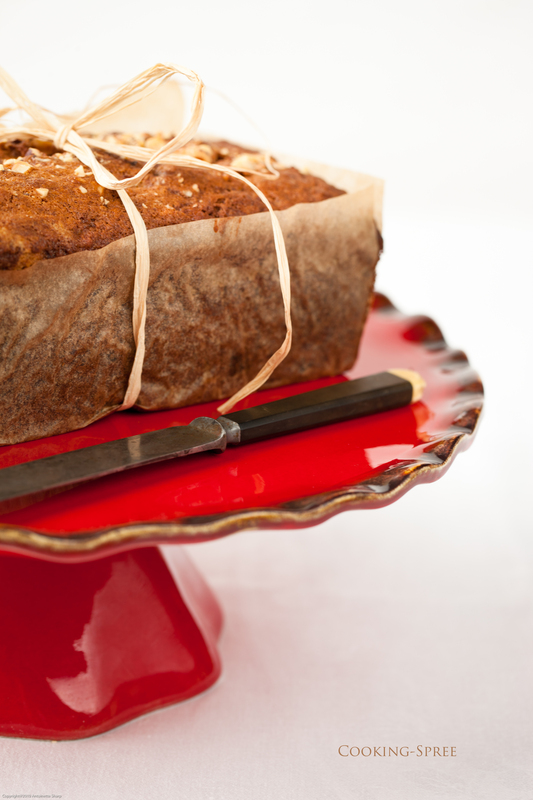 Then I’ll show you how to adapt it so as to end up with a Greek-style festive Easter bread. NOTE: Milk brought to temperature may be substituted for the water. Melted butter may be used in place of the oil. Both of these substitutions will result in a richer loaf. In the bowl of the processor, whir the egg and salt together, then pour into a small cup and reserve. No need to wash the work bowl. 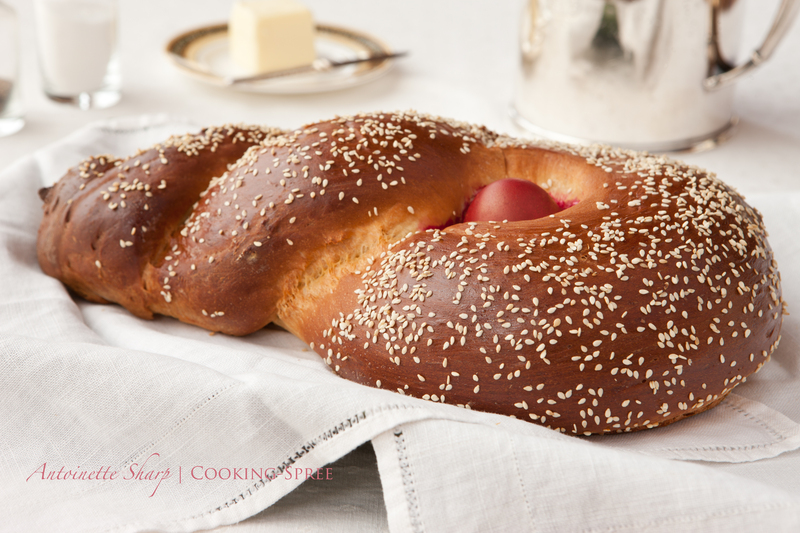 This is the bread traditionally made for Greek Easter, and much like the one our Yaya would bring to the table. Yaya’s kitchen had a converted wood oven, marbled-linoleum floors, tall ceilings covered in tin tiles, and smelled like nothing you’ve likely ever breathed — but should have! I remember, as a young girl, standing in her kitchen, watching in utter fascination as she – wearing an apron over one of her always-black dresses – would gently wrestle huge batches of dough, her stocky arms covered in flour, her hair wound in blonde-white braids around her head, her face serene. Four boys in that family, and they ate a lot of bread. And we did too, whenever we visited our Yaya and Papou. I don’t have my yaya’s recipe for bread. But Yaya didn’t have or use recipes. How to make bread was in her body somewhere. She didn’t think it or measure carefully. She poured from glass bottles, scooped with bare hands, smelled and felt and knew when things were right. This isn’t Yaya’s recipe, but it’s as close as I could come. It’s a brioche-type loaf – tender-crumbed, buttery, with a hint of anise and orange, absolutely delicious. The red egg is optional of course, but quite pretty nestled in its sesame-strewn, braided nest. 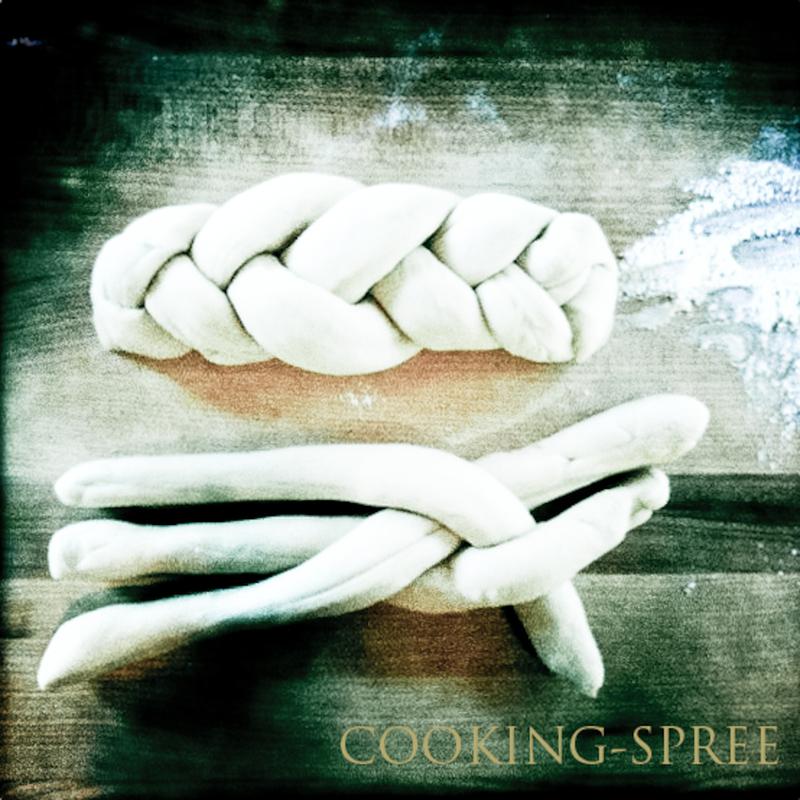 If you decide to use one in yours, insert it between the twisted or braided ropes after it’s risen but before the egg-wash and sesame seeds have been added. You can insert the egg either uncooked or hard-boiled, but it’s typically not eaten after its baked with the bread. In a separate bowl, combine the ½ cup flour, 1 T. sugar, the yeast and salt. Add slowly to the wet mixture of the previous step, whisking as you go, until all is well-combined. Set in a warm draft-free place to proof for 20 minutes. 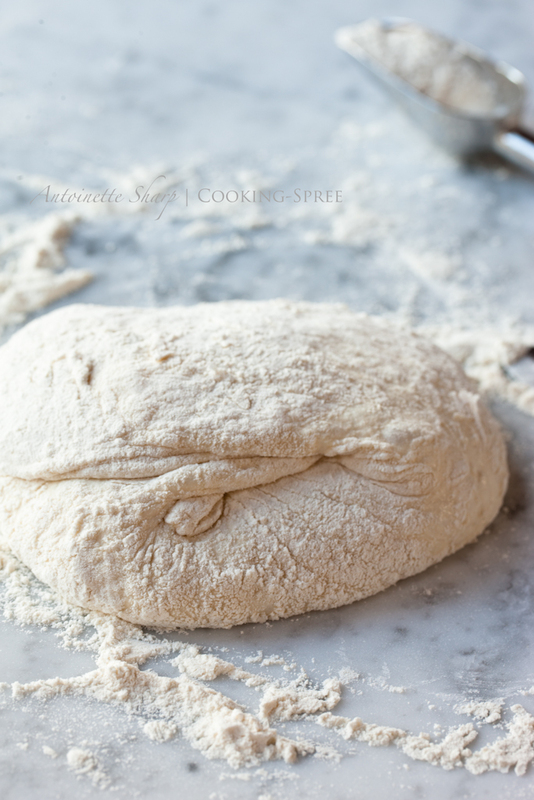 Turn the dough out onto a very lightly floured board. (Or if you like, you can lightly grease it instead.) Roll into a long rope with your hands. Pick up the two ends of your ropes and set them down close to you. Now, just draw one end of the rope over the other, then under, then up over again. (All you’re really doing is making two complete twists.) Gently squeeze the ends together. The halfway mark where you first folded the rope is where the egg will eventually nestle. But not yet. Place on a baking sheet lined with parchment paper. Cover and set in a warm place to double in size, another 40 minutes to an hour approximately. 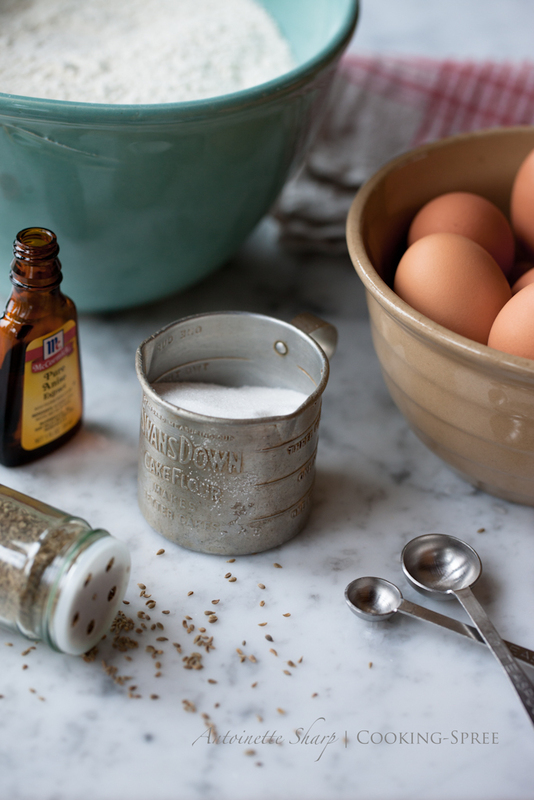 Did you know that ¼ teaspoon of yeast can rise a loaf’s-worth of dough just as well as a tablespoon? It’s true. It will simply take longer for it to do so. But there’s a real beauty in that. The old adage good things take time applies. 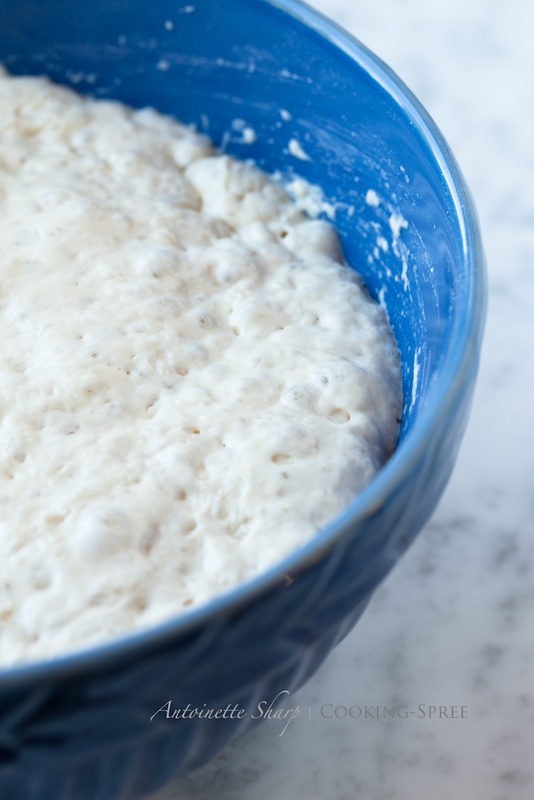 With each extra hour the yeast grows, it adds incredibly to the flavor of the finished loaf. So, though some recipes for home-baked bread will have you adding nearly a tablespoon of yeast, and sugar for it to feast and grow quickly on, and have you rising the dough in a warm place, that’s meant for your convenience and to hurry the process. If you slow it down, you’ll love what happens! 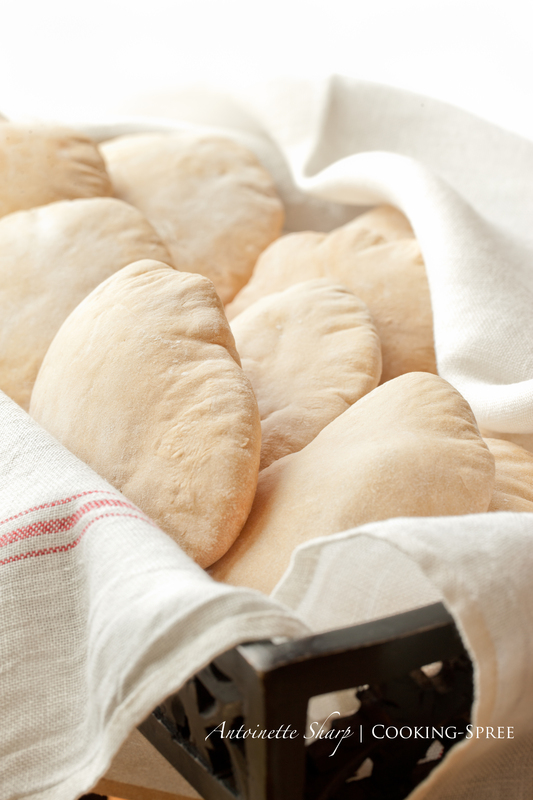 This may be the easiest – and possibly one of the most delicious – breads you’ll ever bake. Start it today, finish it tomorrow, and there will be curtain calls and encores in your future! Do I exaggerate? Occasionally, I have, yes. But here, no. For full-effect, a true Dutch oven is required for this. Cast iron is best because it creates its own highly-conductive little furnace to bake the bread in. Higher-end brands like Le Creuset or Staub are lovely and come in many colors. But just as effective here are non-enameled (lidded) cast iron pots that you might see hanging over a campfire. The latter are inexpensive but require a bit more care in the cleaning, curing and preventing of rust. Always nice to have options though. This method (ingenious really) was first developed and introduced to us several years back by Jim Lahey of Sullivan Street Bakery in New York City. 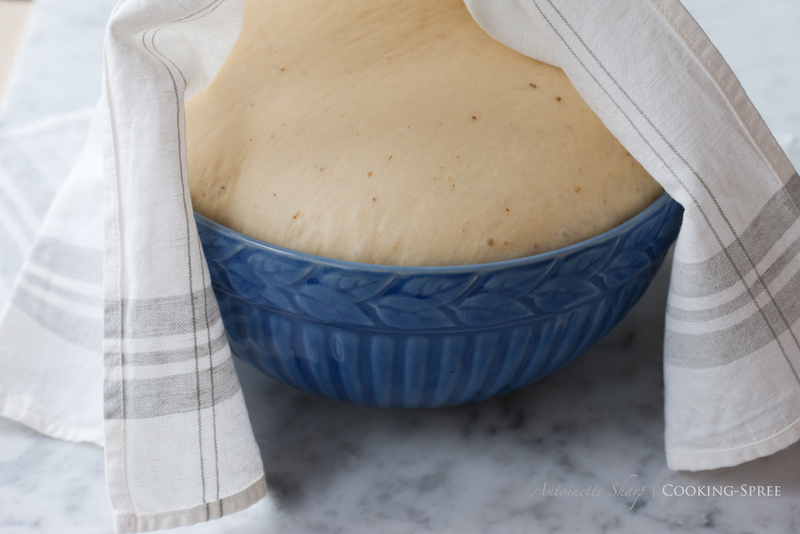 Since its introduction, this No-Knead method has rather revolutionized home bread-baking. Without terrifically expensive ovens (the kind of which are almost never seen in home kitchens), this bread’s crust wasn’t reproducible at home before. 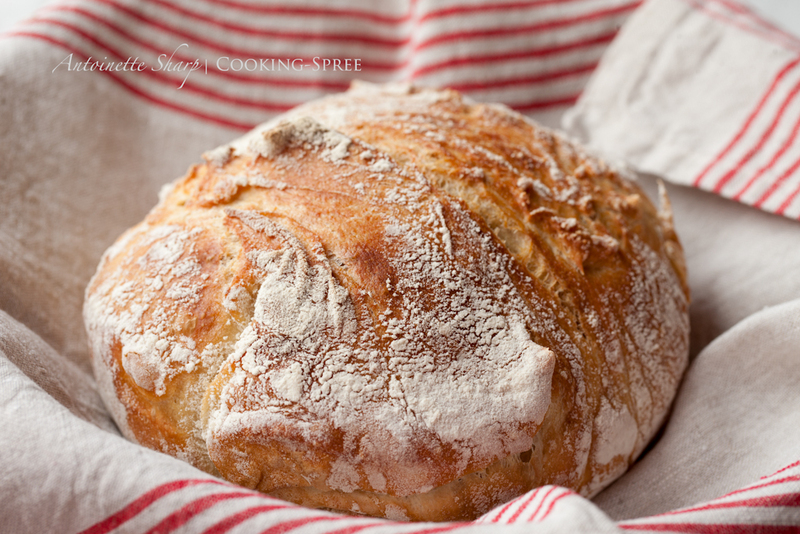 You can see for yourself though, loaves reminiscent of old-world bakeries can now emerge steamy and fragrant from our own rather ordinary ovens.The secret lies in the steam that’s created and contained within the Dutch oven as the bread bakes. and you are the artist! In a bowl, mix the flour, yeast and salt. Stir in the water to blend. If using a scale, place bowl on scale and zero it out. Add 375 grams flour. Add yeast and measure out salt. Zero the scale, and add 375 mL (or grams) of water. Mix loosely. (It will finish the process of blending as it sits.) What you’ll have will be a bit wet, shaggy and messy-looking. Cover bowl with a tea towel and allow to rest (and grow!) for 12 to 24 hours. (If you choose a cooler place, the process will likely take 18 to 24 hours. Room temperature, more like 12 hours.) 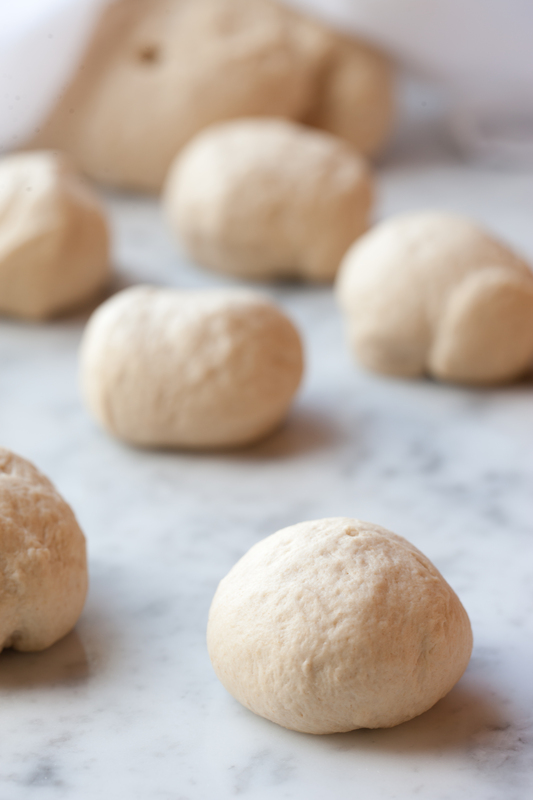 When the dough is dotted with bubbles and very alive-looking, you’re ready for the next step. Only 1/4 teaspoon yeast…amazing right? Generously flour a work surface. Dump the contents of the bowl out onto it. See all the strands of gluten that have formed while you’ve ignored your dough? This is what will create pockets to contain the gas. Fold in thirds (as if you were folding a letter for an envelope, one fold, then another.) Rotate the loaf, then fold each longer end in again. (You’ve made roughly a square shape with rounded corners.) What you have facing you is the seam that will open later, upon the final rise in the oven. After the last two folds. Ready to rise. It’s no secret: you can plunk down a lot of good money on a loaf of good bread. A loaf that actually tastes like bread, with honest texture and chew, with a browned crust that crackles when you tear or bite into it and little bits of it spill onto your lap. A loaf with a labyrinth of airy holes inside (to better hold the butter or olive oil), and an aroma that you want to bury your nose in. A loaf like that will set you back at least a several dollars. Or – easy-as-pie (only easier) – you can make your own. 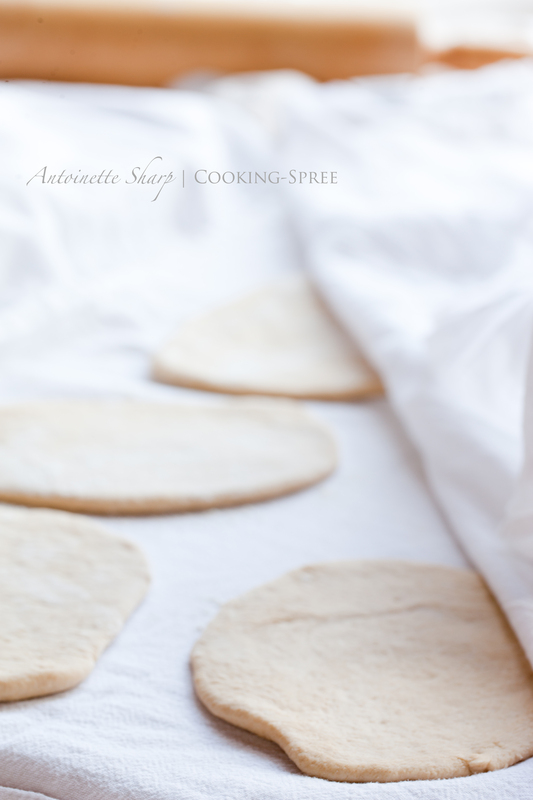 In a recent post I listed bread from your oven as a remedy for the doldrums. It’s certainly that – but it’s not only the eating of it that lifts your spirits – it’s the feel of it, all squishy at first and then soft and powdery like a baby’s bottom. It’s the heavenly aroma that leaks from your oven and drifts through your house. And it’s the sheer miraculousness of motionless ingredients springing to life! Baking bread is simply one of life’s simple pleasures. Eating it is another. The first of these two recipes will give you bread today. The second, using less yeast and undergoing a longer, taste-developing rise, can start today but will finish tomorrow. They’re both delicious, and I make each of them all the time. The second, if you can wait, is a-maz-ing! Both take very little hands-on time, the longer method even less hands-on time, so don’t be deterred by the waiting game. While the dough is doing its growing thing, you can be tending to whatever else calls you. Almost always these days, I’ll bake bread using a Dutch oven. With its lid on, a moist mini-environment is created, one very similar to professional deck-ovens with steam-injection. The crust that results is phenomenal. I’ll give the instructions for with and without a Dutch oven. Turn scale on. If using a stand mixer to knead your bread, place its bowl on the scale and then zero the scale out. (The weight of the bowl will no longer be counted.) Begin scooping flour into the bowl until it measures 20 ounces. Measure in 2 teaspoon salt. Again, zero out the scale. Add lukewarm water until scale registers 12 ounces. Spoon 1 teaspoon yeast over the top and allow to dissolve in the water. Fit the bowl onto your mixer and using the paddle attachment, incorporate the ingredients fully. Remove paddle and replace with the dough hook. Knead until the dough is smooth and elastic. This will take about 10 minutes. Remove the bowl from the mixer, cover it with plastic and allow it to rise to about twice its size. 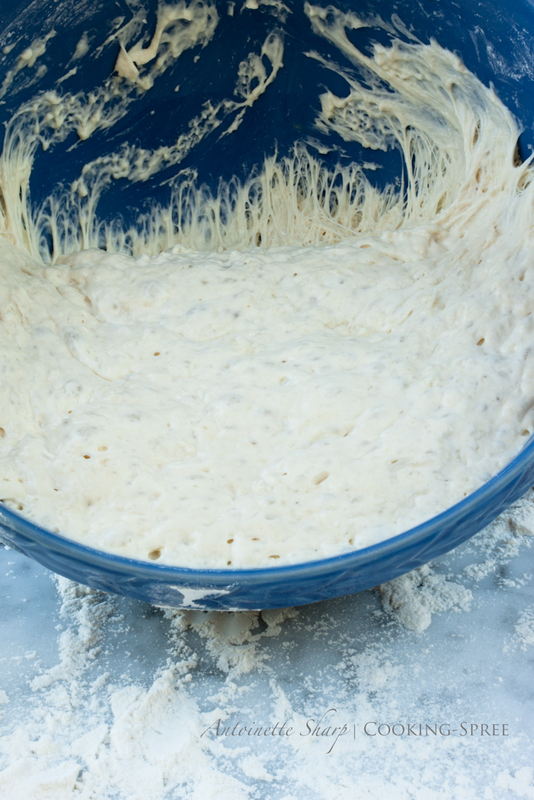 Turn the dough out from its bowl onto a floured surface and knead it to expel excess gas and redistribute the yeast. 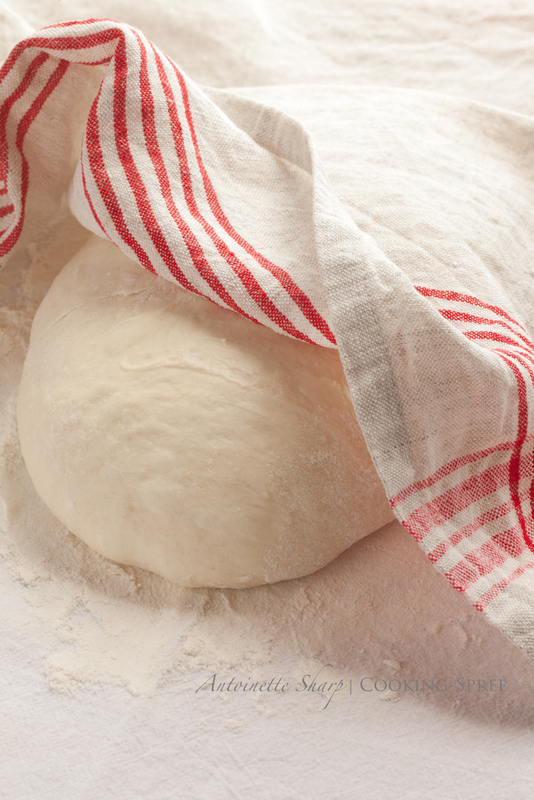 Forming the loaf: Cover with a dish towel and let rest for 15 minutes. 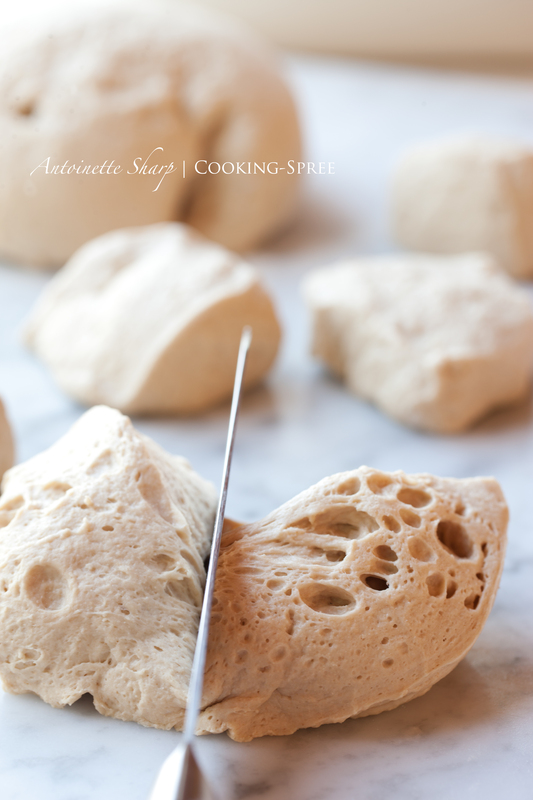 To form a boule (ball-shaped) loaf, simply roll the dough back and forth on the cutting board or counter following a circular motion until smooth and round. Again, cover the dough with a dish towel and allow to rise for another hour. If using a Dutch oven, you can place the boule in the pot and allow it to rise there. (But please refer to the Dutch oven method below before proceeding.) If using a traditional (no Dutch oven method) place the formed ball onto a baking sheet. Traditional method (no Dutch oven) After about 30 minutes of bread-rising – Preheat the oven to 450°F. (Yes, it’s early but the oven gets better, with a more even heat, if allowed to preheat for a longer period.) If you want to create some steam to produce a better crust you can place a cast iron skillet in the oven on a lower rack when you begin to preheat. Then add a cup of water to the skillet (using mitts to avoid burning!) when you put your bread in to bake. Don’t let this confuse you, but you have yet another option here. 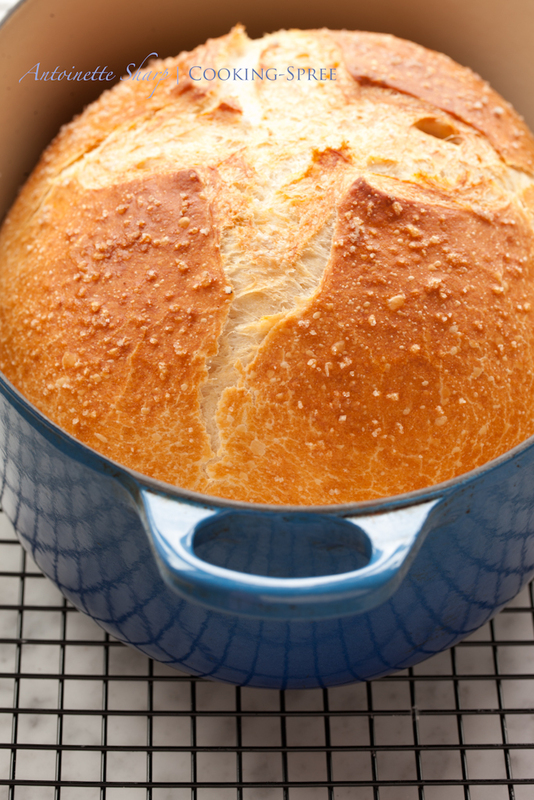 Either a pre-heated Dutch oven – the advantage will be a crunchier crust and a bit more rustic appearance, or a cold Dutch oven – the advantage being that you can allow your loaf to rise in the pan, preserving the pretty shape you’ve created. You might try them both and see which you like better. It’s slightly less “intimidating” if you start with the cold Dutch oven the first time. So I’ll begin there. I caught a little flack from family for sharing the caramel corn. Some thought (kiddingly I’m sure) that it ought to be “sacred,” a family secret, vaulted away. These are NOT stingy people! They’re tremendously generous. Their hearts are huge. But they did have serious qualms about my going public with Ruthie’s caramel corn. And yet…I’m here to share. So while I’m at it (and already in questionable standing with the family)… here comes another recipe from our holiday house to yours. This bread is so deliciously fragrant! 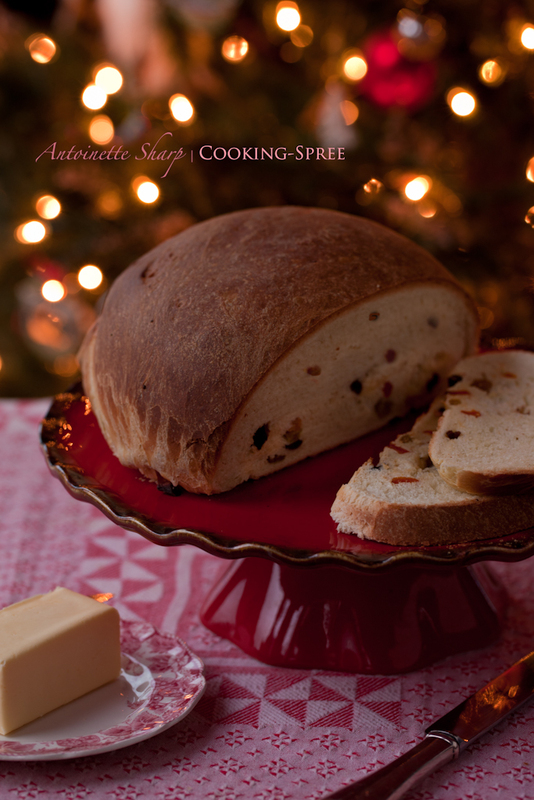 It’s a soft loaf, delicately but surely flavored with anise, slightly sweet and full of colorful dried fruit. It’s the traditional loaf on Italian tables for Christmas and New Years and has been a tradition in our non-Italian family since I was a kid and our mom first learned to bake homemade bread. You can eat it with just a creamy smear of sweet butter or – as we do – toasted, with its fragrance roused to life again. We’ll have it for breakfast along with our scrambled eggs and fresh-squeezed juice. I’ve suggested certain fruits to go inside, but really the choice is entirely yours. Mom used to make it with those candied fruits and peels (which, as a kid, I detested and had to go to a lot of trouble to pick out so I could get to the truly good stuff.) I’m saving you the trouble. Use whatever dried fruits you like…cherries, apricots, golden or dark raisins, cranberries or candied citrus rinds or softer nuts like walnuts or pecans. Traditionally, it’s one half raisins and one half other mixed fruits, but you can do all raisins if you like, or none at all. Be sure though not to skimp on the anise (neither the extract nor the seeds) because that’s where all the heady perfume comes from! Can you stand being adored? Then you will be so glad you made this bread! My personal choice – 1 cup raisins (¾ golden, ¼ dark), and 1 cup equally divided between apricots, tart cherries and dried bing cherries. If I had on hand a bit of candied orange rind, I’d add it too, but I don’t always. Dissolve the yeast in ¼ cup of lukewarm water. (Don’t exceed 115°F. If you don’t have a thermometer, the elbow is a good indicator of the right temp. It’s baby bathwater warm.) Set aside. Place the butter, sugar and salt in a medium size bowl and pour boiling water over top. Stir to melt and dissolve, then set aside to cool. (Again, no warmer than luke warm.) Once it’s cooled, add the eggs, anise extract and crushed anise seeds. (You can use mortar and pestle to crush…they don’t need to be ground.) If you’ve got a stand mixer than can knead your bread for you, hooray! Transfer these wet ingredients to the bowl of your mixer. Measure out 6 cups of flour. Have another ½ cup standing by in case you need it. 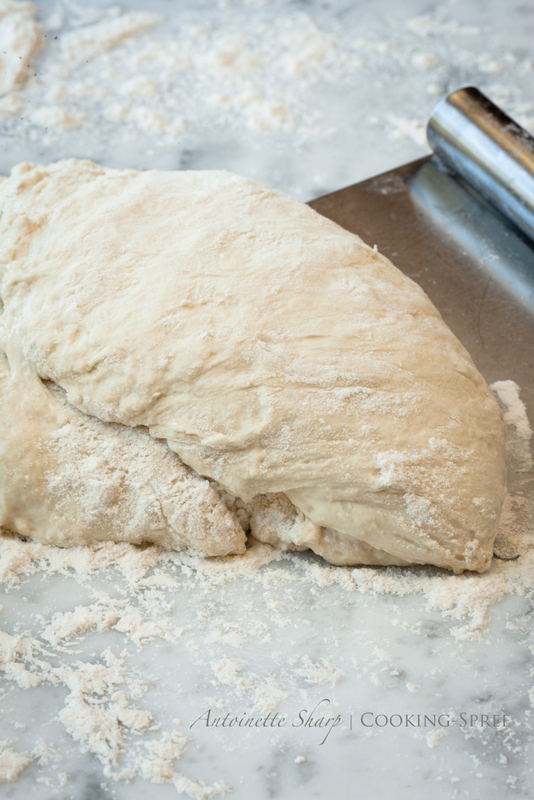 Gradually add the flour to the liquid and knead with dough hook attachment for about 7 or 8 minutes (or longer if required to achieve proper consistency.) You’re looking for most of the dough to be pulled away from the sides of the bowl. When you press the dough with a finger, the dough bounces back at you. And when you lightly squeeze it between your fingers, it almost wants to stick but you’re able to ply your fingers from it without taking dough with. The surface is smooth and baby’s bottom soft. 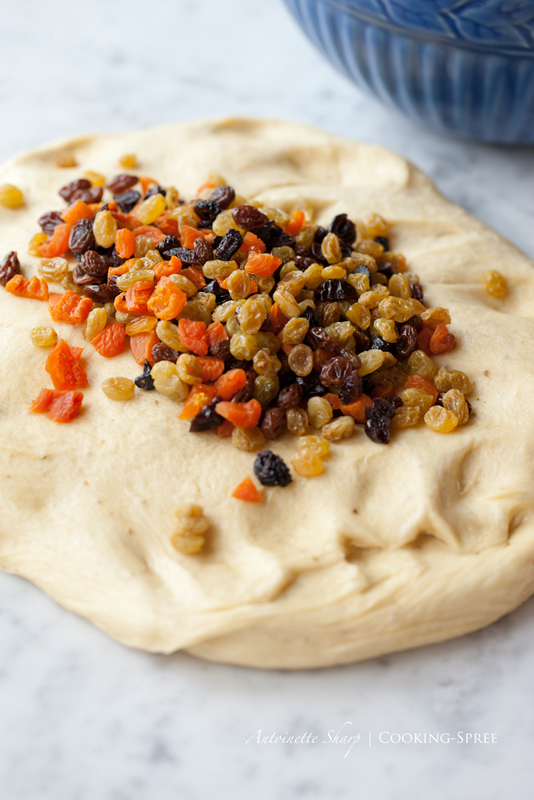 While the dough is rising, place the raisins in a bowl and cover with boiling water. Allow to sit for 30 minutes and plump up a bit. Drain them in a collander and then place them on a clean towel, patting to dry. Cut the fruits into approximately raisin-size pieces. Mix all the fruits together. Once dough has doubled, remove the plastic wrap, and with your fist, deflate the mound. One gentle punch or two will do. Once doubled the 2nd time, split dough in two fairly equal pieces. Allow to rest for 5 minutes under a towel. 15 minutes before you expect the loaves to be ready for baking, place a rack 1/3 up from the bottom of the oven and preheat to 350°F. Brush the loaves gently with melted butter using a pastry brush. Bake for approximately 45 minutes. If they begin to brown too much, lay a large paper grocery bag over the top toward the end. (Don’t worry, it won’t catch fire.) Or use aluminum foil if you’re leery. Remove loaves from oven; cool completely on a rack before cutting. This bread keeps well for days, if wrapped tightly. Or bake ahead and freeze (double-bagged) for weeks or longer. Be sure to bring out before the holiday! and some more photos from our trip. If you’ve been following along, you may recall that one damp gray day it became necessary for me to bring indoors bushels of lemon verbena, listing badly in the rain. You may remember too that – as a happy consequence of this most deliciously fragrant herb having come indoors – our house now smelled like a commercial for the cleanest house on the block (which, no doubt, it wasn’t unless all my neighbors were having particularly messy days.) Anyway, I digress. That day rather than clean the house, I opted instead to churn up some lemon verbena ice-cream, an impressively easy choice to make. I also dried a pint-jar full and with the rest, I made a lemon verbena sugar to store in the freezer for inspirations that might come later. I had plenty of this citrusy sugar to share and so I did. Did you know there was such a thing as biscuit flour? I didn’t. It’s simply a flour milled from 100% soft winter wheat. But you can approximate it using equal parts of all-purpose flour and the lighter, softer cake or pastry flour. If you have cake flour by all means use it. If you don’t, not to worry. 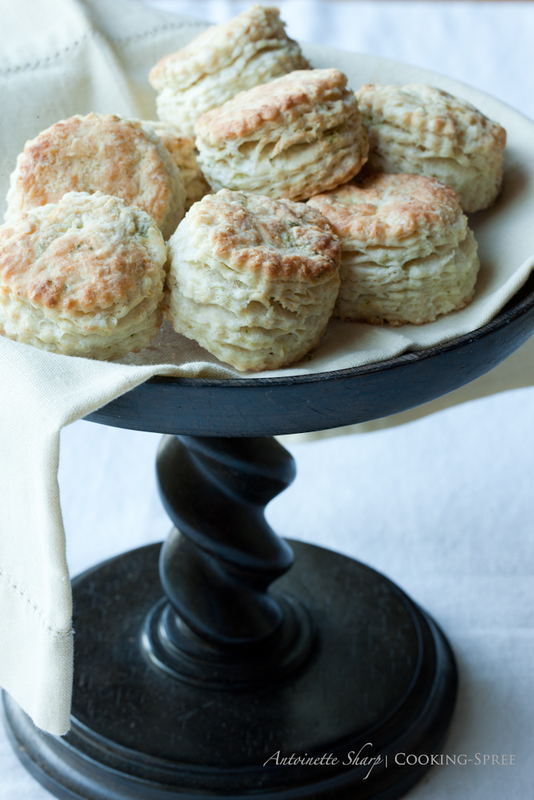 Just use the all-purpose flour but know that your biscuits won’t be quite as flaky and light as they might otherwise be. To top these you may want to try incorporating a drizzle of honey and a bit of orange zest into some softened butter — allow the whole of it to melt down the sides and be caught by your tongue, just in the nick of time! not to whine – but it’s hard on us humans. Do you like to think we deserve something special for our heroic efforts? On a rainy morning when the only reason we rise is because we must, these, and a mug of steaming hot something, make it one fraction easier to leave our warm comfy beds. This recipe reads a bit like a carrot cake. 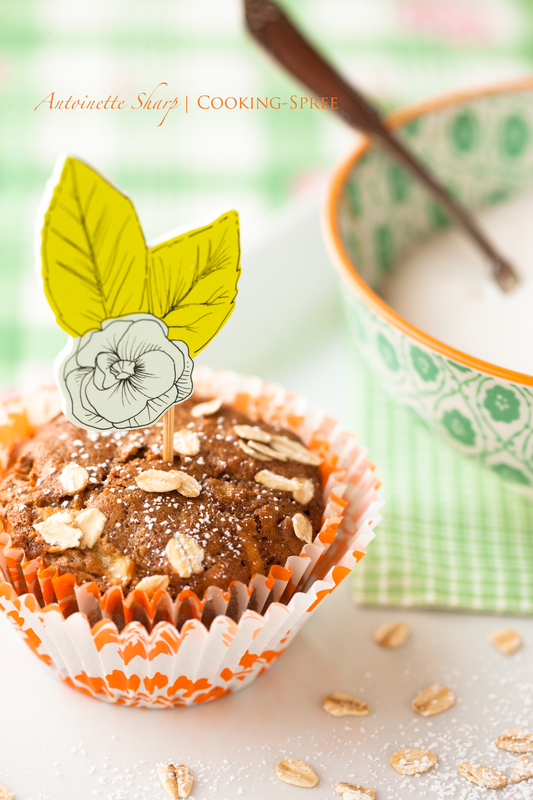 Like the cake, and unlike many muffins, it’s chock full of good things our mothers would approve of. It’s deliciously moist, surprisingly light and un-dense. It keeps very well, and it re-heats nicely (if you’re looking around for something to melt your butter on.) But let’s do better for breakfast than carrot cake. We won’t frost them; instead we’ll top with a liberal scattering of healthy walnuts. We’ll only use whole-wheat flour, and we’ll do one better by adding extra wheat-germ. We’ll grate 2 whole cups of carrots, newly-pulled from the good earth, and add a grated tart apple, a handful of shredded coconut, some warming spices and some strewn bits of candied ginger. And after a few warm bites, we can raise what’s left and call it a glorious morning, because what we call it matters maybe even more than how we start it. Preheat your oven to 375°F. 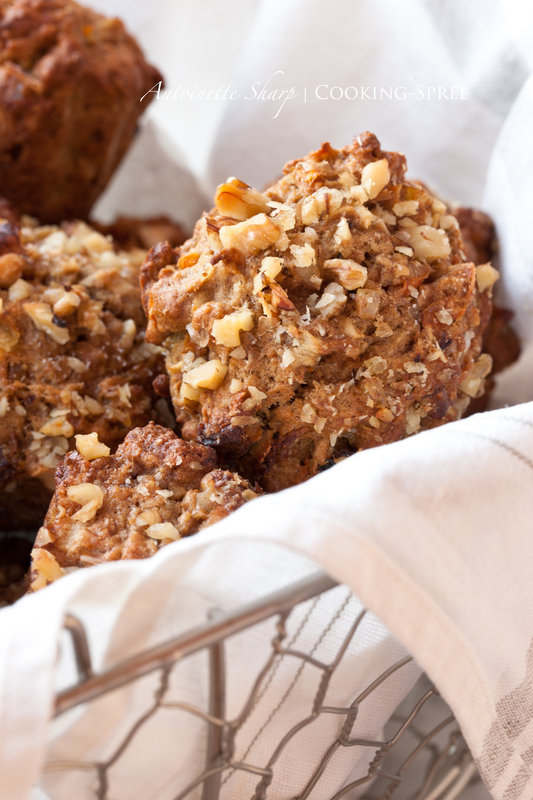 Lightly grease your muffin tin or line with papers and coat with a non-stick spray. 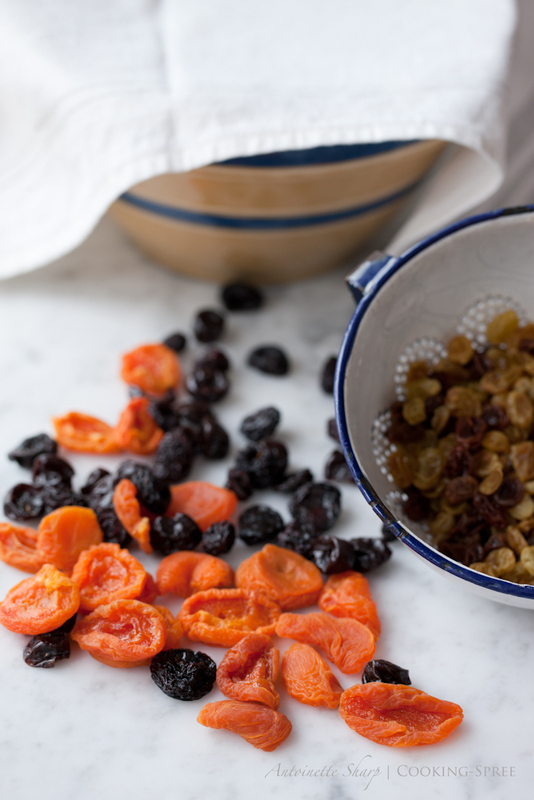 Put the raisins (or the dried fruit of your choice) into a small bowl and cover with hot water to plump. Set aside. In a large bowl, whisk the flour, brown sugar, baking soda, cinnamon, ground ginger, and salt together, until thoroughly combined. Stir in the shredded carrots and apple, the coconut, 1/2 cup of chopped walnuts, finely chopped candied ginger and wheat germ. In a small bowl, beat together the eggs, oil, orange juice and vanilla extract. Add to the flour mixture and stir until evenly blended. Drain the raisins well, and add them now. Divide the batter between 12 muffin cups – they’ll be nearly full, but they won’t overflow. They’ll just dome up beautifully. Scatter with approximately ¼ cup chopped walnuts (or your choice of nut or sunflower seeds.) Bake for 25 to 28 minutes, or until a tooth pick or cake tester inserted in the middle comes out clean. Cool in the pan, on a rack, for 5 minutes only. Then remove the muffins to the rack to continue cooling. Preheat oven to 350°F. 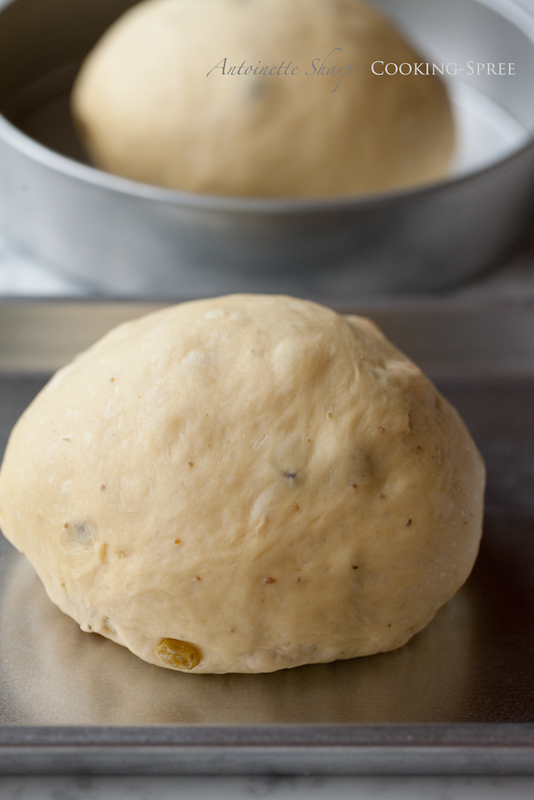 Butter your loaf pans or line them with parchment paper. With a fork, mash the bananas well in a small bowl. Add lemon juice to prevent discoloration; stir and set aside.